Conveyor system for loading hides onto overhead conveyor. Luxford has completed final commissioning of a new materials handling installation at major skin and hide export producer A.H. Hides & Skins Australia, at North Laverton, Victoria. The installation is very innovative and a first for Australia and the skin and hide sector. 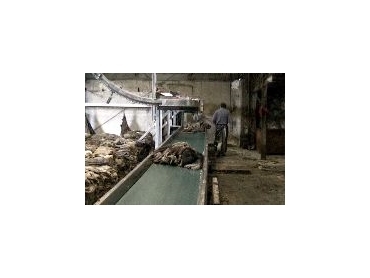 The Luxford system initially involves loading salted cured hides onto a wide purpose-built conveyor. At the end of the conveyor, an operator efficiently loads hides onto an X458 overhead chain conveyor system that utilises a specially-designed hide hook system. Once on the overhead conveyor system the individual hides are gradually raised to an ergonomically-designed height at which time the hides are given a final trim and inspection. At the grading station an operator removes the head pieces and grades the hides into five classes via an adjacent control panel. Hides, whilst continuously moving on the overhead conveyor, are then accurately weighed as they pass through a weigh station. Custom-written software combines the information on the hide grade and weight to determine at which drop-off point the hides are released. The conveyor then moves the hides to twelve weigh drop-off stations, where they fall onto handling tables, corresponding to the various weight ranges. The individual drop-off station tables are immediately adjacent to shipping pallets - minimising the walking distance required to load pallets. This system automatically grades hides to a narrow weight range in order to better determine the quality and the mix of hides received from suppliers and also allows A.H. Hides more flexibility to meet the requirement individual customers. According to A.H. Hides managing director Neville Moses, with the conveying and weighing system that Luxford had installed, productivity and labour utilisation had improved dramatically. "I can now not only meet my individual customers hide requirements quickly and efficiently, but we can now also process significantly more hides in a day in less time and with less labour. This will give us lower costs and the ability to better compete on the global market." This system is one of three recent projects that Luxford has installed in the Victorian skin and hide sector in the past two years.